The harsh winter weather can cause severe damage to your home, or worsen problems that haven’t been properly addressed. Home inspectors are trained to recognize signs of damage, properly fix minor problems before they grow, and help protect your home before issues occur. With that in mind, Building Pro has compiled a list of techniques to help you identify which parts of your home you should check for signs of damage, and how to protect your home from ice and snow. Insurance won’t cover damage that’s deemed preventable. It’s important to take every precaution to prevent damage to maintain a valid policy. 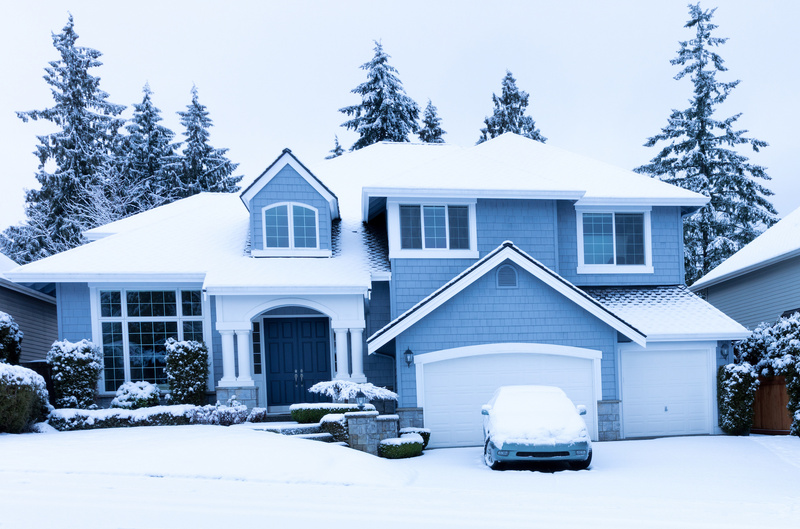 Ensure your policy covers winter storm damage and update it as required. Bursting pipes is one of the most common and expensive problems. Proper insulation around pipes outdoor pipes is essential to preventing this major, but preventable issue. If you lose heat during a cold spell, leave your taps slightly open so water can flow through until the heating issue is fixed. Read the link for more steps and tips on Preventing Frozen and Burst Pipes. Home inspectors often warn homeowners, buyers, and sellers to ensure the roof and gutters are properly maintained, and roof shingles are secure. Replacing a roof, or living under a damaged roof or clogged gutters can lead to serious and expensive issues. During heavy snowfalls, remove the snow off of your roof with a long-handed rake, and ensure gutters are cleared to prevent ice dams from building up, and causing water damage when it melts. Too much snow can cause serious structural damage. Inspect your roof for ice buildup and icicles throughout the winter months. Icicles are often an indicator of heat escaping from your roof. To learn how to safely remove them and prevent them, read more about Icicles and Ice Dams. Proper insulation is essential in winterizing and protecting your home from the cold winter weather. Home inspectors always have a list of questions and concerns when inspecting a home; from ‘should aluminum wiring be replaced?’ to ‘is this home properly insulated?’. Signs of a poorly insulated home includes cold floors and walls during the winter, and hot air during the summer. Mold growth, high energy bills and uneven heating or ineffective cooling are also indicators of poor insulation. Check the area around your doors and windows are properly sealed as well. For more information on insulation, read What you Need to Know About Home Insulation. If you’ve got any cracks or holes in your foundation or siding, it needs to be fixed as quickly as possible to prevent more serious problems. Cracks are doorways for both heat to escape, and unwanted critters to enter! Sealing and repairing these problems will save you money, time, comfort and high energy bills! Hiring a reputable professional is recommended, but for smaller jobs, learn How to Repair Cracked Concrete Foundation, or contact Building Pro Home Inspectors. Icy walkways and driveways can be a hazard for you and your guests. Any injuries that occur on your property can be very costly! Plus, ice may damage the pavement beneath if it’s not properly cleaned and shoveled. Salting your walkways or using one of the many Innovative and Environmentally Friendly Alternatives is a safe way to protect you and your home. A bad home inspection may cause homeowners to overlook major issues. Make sure you are prepared and that you’re home is properly inspected. Contact Building Pro for a reputable home inspection today.